Mahopac Board of Education’s new President, Michael Sclafani, at right at Tuesday’s Board meeting. He takes over from Ray Cote, who has resigned. School attorney Ralph DeMarco is at left. 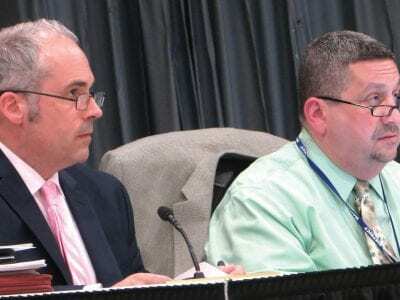 Mahopac Board of Education President Ray Cote has … Please login below or purchase a subscription to the Putnam County Courier to access this content. Three military helicopters flew over Carmel Monday night under the cloak of darkness. The U.S. Army conducted its aviation urban navigation training in conjunction with the Paladin Center on Seminary Hill Road. 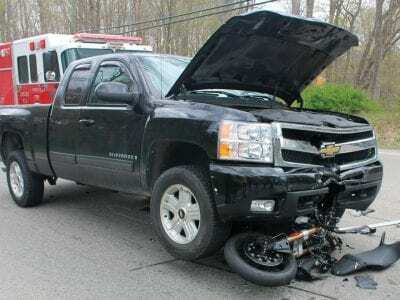 Felix Carcano, the corporation’… Please login below or purchase a subscription to the Putnam County Courier to access this content. Ball alongside Rep. Sean Patrick Maloney, with whom he has worked more closely recently. 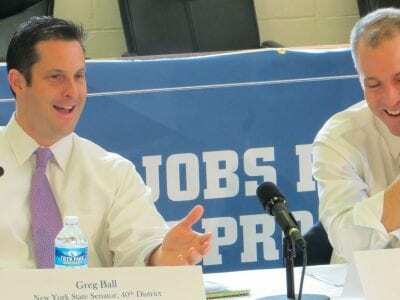 Ball said he will not run for county executive. 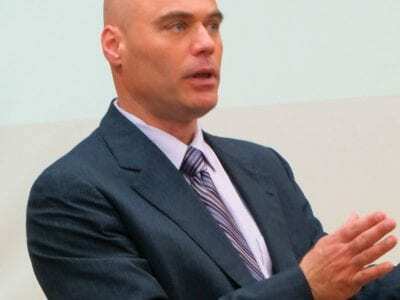 State Sen. Greg Ball, who has been mentioned for months as a potential candidate for county executive, will not b… Please login below or purchase a subscription to the Putnam County Courier to access this content. Bruce Walker leads discussion at last week’s meeting. Plans for the future of the Tilly Foster Farm were unveiled last Thursday evening at a forum in Carmel and tonight, Thursday, members of the Putnam Legislature will receive the data during a… Please login below or purchase a subscription to the Putnam County Courier to access this content. 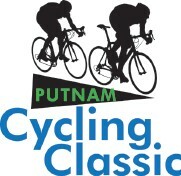 The on again—off again—on again Putnam Cycling Classic will be held Sunday rain or shine. 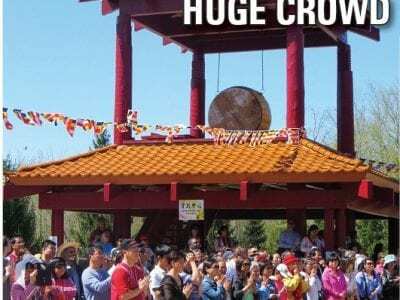 The event was originally scheduled for last weekend but was canceled 72 hours ahead of time due to anticipated inclement weather that never materialized … Please login below or purchase a subscription to the Putnam County Courier to access this content. The Putnam County Chambers of Commerce held its annual meeting on Tuesday, May 14, to elect a new Director and look forward to new initiatives aimed at supporting the business community and economic development within our county. The Chambers will b… Please login below or purchase a subscription to the Putnam County Courier to access this content. Walkers proceed along Gleneida Avenue Saturday morning. 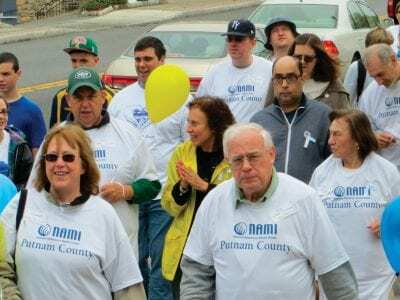 Overcast weather failed to deter the spirit of more than 100 participants Saturday who took part in Putnam’s first Mental Health Awareness Walk. Sponsored by NAMI— National Alliance … Please login below or purchase a subscription to the Putnam County Courier to access this content. A new Smart Board is headed to Carmel High School thanks to the Hannaford Supermarket chain and shoppers who purchased products at the local market earning “school dollars” earmarked for CHS. A check for $1,000 was presented to principal Kevin Carro… Please login below or purchase a subscription to the Putnam County Courier to access this content.